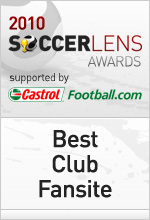 It feels great and an honour, especially when we are one of the only two United websites being shortlisted, we have worked really hard on the site the last few years so this is a great boost for us all. 2) What kind of year has 2010 been for ManUtdTalk? 2010 has been a good year for us, activity , content and website awareness has increased, long may it continue. We have a great team of die hard fans who work on the site, it becomes a passion which I think reflects in the content and feel of our community, we have sensible and moderate staff, active participation and interactions with members by staff, and a smaller but closer community of regular members. I would have to say The Republik Of Mancunia. 5) What’s next for ManUtdTalk? ManUtdtalk is an on-going development, I’m never satisfied and am always looking to improve the experience for members as well as develop new features. I can’t say too much but we have some exciting things going on behind the scenes which we hope to roll out in time for the 2011/2012 season, watch this space as they say.